1. Option 1: Create a cell where our ex-Gurkhas could report and seek help. This was discarded as AWCs are already in existence and would need to create a separate cell in Nepal particularly for this. 2. Option 2: Assist with the education of ex-6th Gurkha Children. This would be a continuing commitment and would also need a cell in Nepal to select candidates. 3. Option 3: Assist in repairing and retrofitting the AWCs in Gorkha and Lamjung which were affected by the earthquake. The trustees meeting, after some discussion, opted for option three and a resolution was passed to this effect. The Regimental Trust donated £48,000 for the repair of both AWCs. Her Majesty, in her royal address printed in the Durbar brochure, mentions our donation towards the repair of AWCs affected by the earthquake. She also makes mention of the 6th as “My Regiment” which indeed is a matter of great pride and honour for us all. The repair and retrofitting of both AWCs began on 20 March 2016 and was completed on 25 July 2016. This was the case with AWC Lamjung but AWC Gorkha cannot be far off. 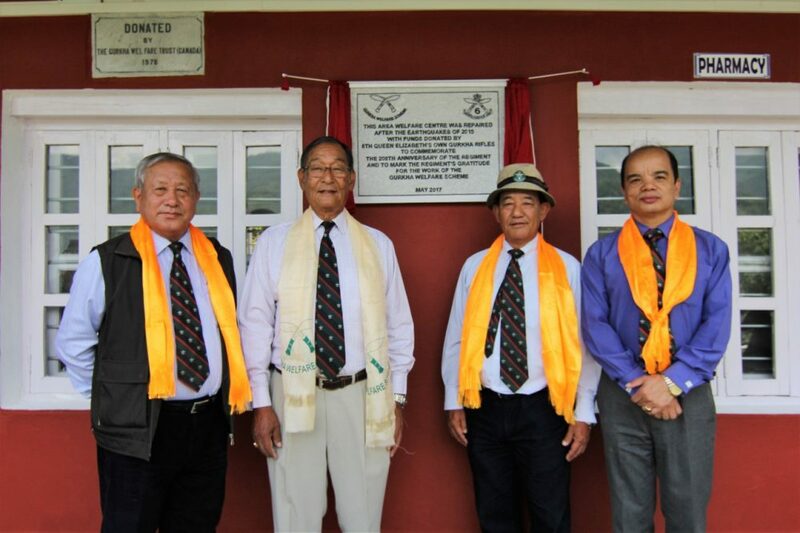 The Gurkha Welfare Scheme completed the task in a very short span of time and without hampering the needs of the ex-servicemen who came to seek assistance. 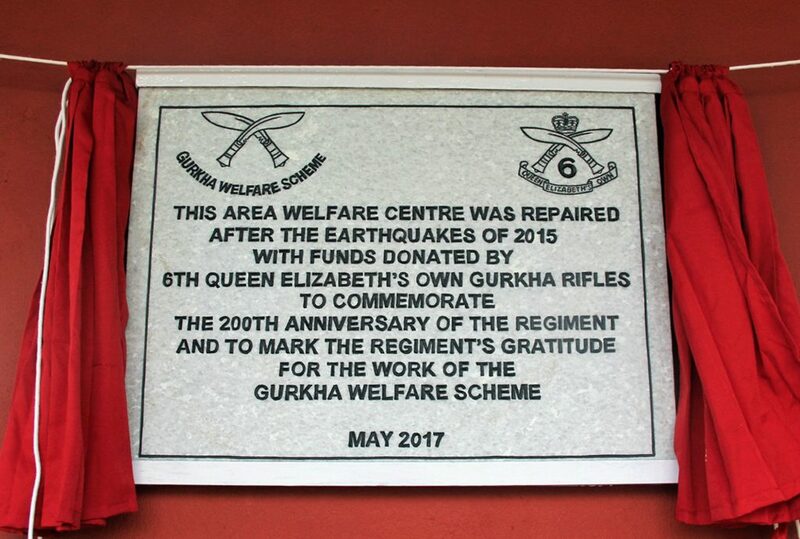 We are thankful to The Gurkha Welfare Scheme. 1. AWC Gorkha: Captain Bhuwansing Gurung, Chairman of The Regimental Association Nepal on 23 May 17. He was joined by Major Gyanbahadur Gurung and the Secretary, Lt Purnabahadur Gurung. 2. AWC Lamjung: Major Gopalbahadur Gurung MBE. Gyan Saheb, Purna Saheb and Balkrishna Saheb, AWO Lamjung, were present. The Field Director GWS was also present at both inaugurations. Nicely engraved marble plaques adorn both AWCs denoting the assistance provided by 6 GRRA. The Buros are very grateful for our help in getting the AWCs going again.